He is buddies with Brandon, they went to high school together and now they are here in Japan. God has great things I store for you Nelms. Brandon comes to us via Dana Point California where you can get some awesome surf. God bless you Brandon great that you are here. Angie has spent two semesters at CCBC Murrieta and this will be her third one with us here in Okinawa. Thanks Angie for being with us, we are looking forward to a blessed time with you this semester. Back from Ishigaki Island, and now she is 20 years old. That is why she went back to Ishigaki, to celebrate "coming of age day". We are blessed for Taliya as she starts her 3rd semester. This will be Cameron's second semester at CCBC. Last semester he was in Hungry. I can't believe that he is not cold. We are all freezing, but from where he is from it gets below 0. Well really from Sonora, California. But he comes to us via Machida with Pastor Jeremiah Boek. Alex was supposed to be with us last semester but this is God's timing. God bless you Alex. The cafe is complete! We finished up today and just in time. The new semester begins this Monday. The new batch of students are exciting. We are looking forward to a great semester. It is always a blessing to gather for prayer. That is what we do every Friday night at the Ruiz house. Always a blessed event. Amanda's mom came for a surprise visit from Michigan. She is here to see Amanda and she brought along Ally. This will be Ally's first semester of Bible college. We are excited that they are here. The church is young but on the move, it was a blessing to visit Pastor Quint and Yoli in Clovis. The church is 4 months and growing, please pray for the fellowship there in Clovis for the continual moving of God’s Holy Spirit. Our Korean Brother is back and we are all excited. Moses was such a blessing last semester and we know that he will be the same again too. God bless you bro, welcome back! Via Hawaii he comes our way from Pastor Bill's Church. He is a little bit tired but all we have to do is keep him awake for a few more hours. Rob is in Tokyo right now meeting with his future in-laws. This is a great picture of them both. Be blessed you two. It is really coming together now; just a couple more days of setting and grouting. The gang did a great job, it was a real joint effort. Our two newest Bible College Students are trying out the Mochi. Satsukosan blessed the interns with a fun party. We had every Mochi imaginable. Praise the Lord! We were super blessed! We found a small local vegetable stand where an old grandma and grandpa grow vegetables and sell them cheap. Okinawa has the healthiest foods on the planet when you buy them locally grown. We are going to live forever. The First Student Has Arrived! Let me introduce to you Martin, he come to us via the High Desert in California. It is a blessing to have him with us. We got to get to know Martin while we were in California this Christmas. He has a wonderful family. God bless you bro, we are so blessed to have you this semester. It is coming together! The cafe is looking sweet (in the words of Tom Cotton). The hard work us paying off. There is still a lot more to do. "God, please pour out your Grace upon us". Amen! Today we celebrate Naoko's birthday. She also will begin Bible College next week. We are so blessed for you sister. Praise the Lord! The guys and gals are doing a great job! Thank you gang for all your hard work. The cafe is looking excellent. It was a blessing having Yoko with us this weekend, but like always it was too short. God bless you girl, it was such a blessing having you with us. Have a safe trip back to Kobe. Love, your Ginowan Family. Joanna baked an awesome homemade chocolate cake for Tamiko at w2. It was delicious! A great celebration. Amanda received her 3 year visa to continue to serve here in Japan. We are so excited! She is such a blessing to all of us. God bless you Amanda and Praise the Lord! We are tiling the Cafe so there is no room to be cooking meals at the church. So like old times we will be eating at the Ruiz house for the next few day. Ahhhh cooking at Ruiz cafe. She is visiting for the weekend. It is always a blessing to have her with us. The bad thing is that her visit will be too short. Tamiko celebrated her 24th birthday on Thursday. The girls had a good night in at the Girls D House. Naokosan made dinner and Hannah baked a cake. Happy Birthday Tamiko! Please leave her a birthday greeting below. The guys are working hard tiling the café before the new semester begins. It was so hard finding the supplies. First we had to find tile that was on island, then we had to find the thinset (which no one carries) but then we found someone who had a new Japanese shipment sent in but was actually going to send it back (Praise the Lord!) We bought it but it it was so expensive (4 times the cost of Portland cement). But we had to get the good stuff. Thank you Jesus for your provision. Pastor Rick pointed this out to us; this is a good picture. There is only one problem, Asa is missing. This was taken on the afternoon on Huntington Beach Pier after we came back from Pastor Greenroyd’s Church. It was a cold day, but a cold day on the beach is better than a warm day at work. It was a beautiful morning the other day. The picture does not do justice to the brightness of the rainbow. Early morning workouts, the only way to go. We are chillin out, literally! It is 10c or 50F. Which is really cold out here. Anna is eating her nice warm ramen bowl. A great day to eat some curry! We made it back safe from California. It is cold on the island. Asa is getting ready for a nap and Joanna is right on the phone catching up. Praise the Lord! Thank you Jesus we are back home! The flight from LA was fast and smooth, little turbulence, Praise the Lord! It is 6am right now and I am surprised it is still dark outside. Next stop, Okinawa. Praise the Lord! The gang are all beginning to come back. First there was Amanda, then the Robb’s, now Naoko and Tom Cotton. Great to see you all, we cannot wait to join you soon! Your beautiful smiles put a big smile on my face, we love you all! So the Ruiz’s will arrive on Friday, and Joel will come on Saturday. Get ready Okinawa, here we come! Well, it is that time again. The time to leave California and head back to Okinawa. Thank you Jesus for such a fruitful time of fellowship and ministry. We look forward to all that the Lord has in store for us on the coming days ahead. This guy is the big "21" I cannot believe it! Thank you Lord for all these years of blessing. Happy Birthday Zach! Now that is a huge Steak! We celebrated Zach's birthday today and his Grandma cooked him a huge ribeye steak (this guy is spoiled). The beginning of a good meal. It was such a joy to have these gals with us here in California, but now it is time for them to head back home. Aya will be going back to Nagano so we are totally going to miss her. Naoko will be heading to the land of Paradise so we will see her soon. In the City of Fort Sumner, Billy The Kid is buried and there is a museum dedicated to him. It is. Big draw to the area there in New Mexico. Quint was my best friend in 6th grade at Washington Elementary School in Corona, California. Now he is pastoring and serving Jesus in New Mexico, this is incredible. This is one great family. It was a blessing being a part of the new work in Clovis. God has already brought a good group of people to be a part. The people are a real blessing and really friendly. God bless the new work in Clovis, NM. Literally we were "chillin" out at a park. It gets cold in Clovis. But it was a beautiful day! Everyone was having a lot of fun. It was in Clovis, NM that the Famous Buddy Holly recorded his first hit single "That will be the day" in this little studio. It was a trip to see this humble place where it all began. David looks good huh! On Saturday mornings Quint teaches at an assisted living center for the elderly. It was a blessing to minister to these season Saints. Joanna and I are flying to New Mexico and then renting a car and driving to Clovis, NM to visit with Pastor Quint Betts and family who have just planted a new Calvary Chapel in the area. 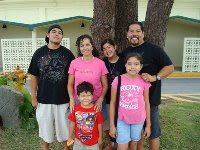 We are looking forward to spending time with the Barrios' family who will be driving down from Oklahoma. I had some surfing materials delivered to the café the other day. I asked Eder and Rob to measure the deck pads to see how large they were. I was sent this picture. Instead of sending the measurements, Vunder used his body to send the message. They say a picture is worth a thousand words, I was just expecting the words. But I did get the measurement. Thanks guys. I do hope you guys are being productive. I am afraid to ask what Brevik has been doing with his extra time. I hope it does not involve hair coloring. The whole gang is here! Can you see them? Jessika, McCandles, Dean, and our newest student; Martin. You are going to love him Eder, another Hispanic homeboy! This is a cool picture. It was great seeing our two buddies again, they are doing well. Logan just got a new car and Cole got a bigger hairdo. With all seriousness, Cole will be finishing up at Murrieta and Logan is still praying for the leading of the Holy Spirit. Please pray for both of our brothers. It was such a joy to see Mark Davis and the family. Praise God that we were able to hook up together for this short time. Please pray for Kegan, it would be such a blessing to have him come and serve with us again.